Amazingly, fatherhood can change people completely, turning potential criminals into good, law-abiding citizens. Research has shown that many people from low-income families, who expected nothing but bad things for them in the future, living in poverty, changed their lifestyles completely once they became fathers. Namely, having a child resulted in one’s pursuit of a better life, finding new jobs, refraining from criminal activities etc. Some people involved in the research about these “regenerative” powers of fatherhood even said that, before they became fathers, they expected to be dead by the age of 20. This attitude made them reject the future since they had nothing to expect from it. However, fortunately, having a child changed all of this and gave these people something to live for. Yet, having a child is not an easy life. The main change that affected new fathers was the necessity of finding a well-paid job and improving the lifestyle in general. These fathers placed themselves subordinate to the needs of their children, doing their best to provide for their families, instead of spending day after day in depression and joblessness. Moreover, a child makes the bond between a man and woman stronger, keeping caring, love and warmth present in the relationship. 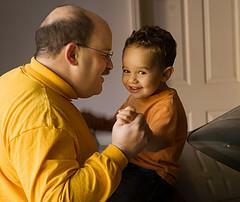 Many males have the potential for being fathers dwelling deep inside their minds and personalities. Sometimes, these males find themselves in difficult financial positions, squandering their lives away due to depression and lack of motivation. Fortunately, having a child can make a significant change, since it can introduce something new in the lives of these people, making them wake up from the status quo and become more responsible, having someone other than themselves to look after. However, the society needs to help these new fathers provide for their children. Many companies take advantage of fatherhood, knowing that fathers are more likely to be responsible and dedicated to their work. This is good for these people since they are capable of finding work more easily. Nevertheless, there is still room for changes since many fathers remain unemployed or underpaid. Thus, companies should be capable of helping young fathers find a job in order to support their families and take good care of their children. Reducing this economic pressure on fathers and their families will help their children lead happy and healthy lives. All in all, fatherhood can truly change males, turning them into responsible and caring individuals. However, the society needs to help these people, since without this factor, many fathers will not be capable of expressing their full potentials. Abortion at 16 - should it be your decision or your family's? What's wrong with our world right now? Emotional effects of conductive hearing loss? Does NIHL affects people of all ages?